“Frizz Head” Gaddafi and Sons Finished: What Now? The first signs of roadside executions by the victorious rebels in Tripoli should serve a warning that all will not necessarily be well with the new regime, if indeed it finally ever gets established. While there is no doubt that the victory was hard won, even with most of the experts pronouncing that “Frizz head” (as the rebels call him) is finished, it does not necessarily reflect massive support for the rebel cause since NATO air support had a huge impact on swinging the balance in the rebels’ favour. The frequent assertions of the Benghazi-based Interim Transitional National Council to be representative of the people of Libya, while clearly acceptable to the Arab League, France and Portugal, has met with only grudging approval from the other interested parties and the 30 or so nations now accepting the council, seem to view it as a marriage of convenience. On looking at the membership of the Council the key leaders seem largely dominated by the anti Gaddafi half of the tribal divide. The rebels’ leadership is also strongly dominated by the previously downtrodden tribes from the north-eastern Harabi confederation and some of the key Gaddafi leaders who defected early on also had Harabi affiliation. These tribes have strong affiliations with Benghazi that date back to before the 1969 revolution which brought Gaddafi to power. The fact that the rebels in Misrata (which is nearer Tripoli) claim that they have no intention of taking orders from the Transitional National Council underlines the failure of the Council to convince all of their representational status. The rebels have been supported by a motley collection of those wishing to dominate in the area including al Qaeda. Although the official line from Britain takes no official note of the underlying sectarian and tribal interests, it is unlikely that their diplomats and intelligence organisations have not kept their government informed. Despite President Obama’s muted protests cautioning against on the ground support of such a disparate group including al Qaeda, the US are compromised by their commitment to NATO and their natural desire not to have their NATO allies take over control the rich oil reserves by default. Despite President Obama’s assurances 5 months ago that the US support for NATO was only to protect embattled civilians in places like Benghazi and that it would be over in a matter of weeks, the US involvement with NATO grew by the expected “mission creep”to a full air based military campaign of five months said to have cost at least $10 billion dollars at a time which the US could least afford it. Now the expensive part of reconstructing a good part of Libya begins with the winning of hearts and minds still a distant dream. Deputy Prime Minister of Britain, Nick Clegg has assured us that Britain will not make the same mistakes in Libya as were made in Iraq. Good luck, Mr Clegg. If the downfall of Gaddafi and Sons was part of the Arab Spring, the forecast is for a long, hot and uncomfortable Arab Summer. This entry was posted in In the news, Libya and tagged al Qaeda rebels, Benghazi, Frizz Head, Gaddafi, Gadhafi, Harabi confederation of tribes, Misrata rebels, Nick Clegg, oil contracts, oil workers, rebels divided, Transitional National Council, Tripoli falls. Bookmark the permalink. 4 Responses to “Frizz Head” Gaddafi and Sons Finished: What Now? The essay above notes the NATO bombing but it does not mention the other ways NATO is involved. 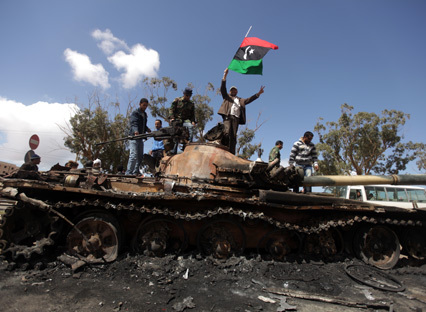 The essay above, mentioning the ITNC, implies this uprising is just the downtrodden tribes against Gaddafi. That is not an accurate representation of who was critical in getting to the current state where Gaddafi might be ousted. I do not agree with an implication that the popular uprising in Egypt, which truly caught the Western leaders by surprise, is in any way similar to the uprising in Libya, which involved substantial military action by NATO, as if both are part of an Arab spring. You make a reasonable case. My intended point about the Council in fact was more or less the same as yours. ie The fact that the rebels from Misrata do not support the Council and the fact that al Qaeda was involved suggests that that Council does not represent everyone involved in the rebellion. I also agree the NATO was involved at a number of levels and I am sure their position was compromised because some of the participating nations had a vested interest in the oil which is why Obama’s defense of civilians rapidly escalated. You are also right about the big differences between Egypt and Libya. In my defence it was the French, US and British governments that were making the claim that Libya was an extension of the Arab Spring. I also note that I wrote this before the massacres by both sides were reported. I was simply predicting it was going to happen. I have read of far too many civilian deaths that are succeeded either by denials or claims of an accident or weapon malfunction. As the last link above mentions, NATO launched a multitude of bombs that knowlingly will result in deaths of civilians. I had not read of any effort (in action, not words) that would eliminate our bombing of civilians. This is not a war between 2 field armies like in WW2. This is bombing a country in civil disarray. Bombing ‘suspected’ enemies means bombing a target that includes all civilians in the area.